Star Trek is continuing to live out its comeback in a big way, with a new film due out this month and the first television version since 2005 scheduled to premiere next year. This could have been the perfect time for the Star Trek­-inspired Star Ocean video game series to propel itself back into relevance. 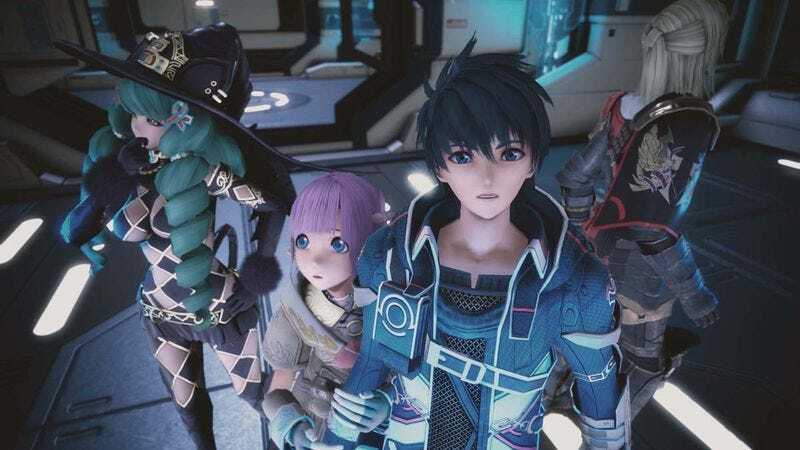 But while the series continues to look to humanity’s bright future, Integrity And Faithlessness shows the developers have learned very little from Star Ocean’s past. This latest entry starts off by fully embracing the most worn of Japanese role-playing-game tropes. Fidel Camuze, a spiky-haired swordsman living in the shadow of his legendary father, sets off with childhood friend and healer Miki in search of help protecting his village from raiders. To that end, they enlist the gallant knight Victor and the sorceress Fiore, who’s apparently such a respected magical researcher that she’s allowed to trade out her traditional robes and dresses for a skintight patchwork costume accessorized with a cat tail and black angel wings. Along with fighting against a common enemy, the group also swears to protect Relia, an amnesiac little girl with amazing magical power that the crew rescues from a crashed spaceship. The collision of science-fiction and fantasy is nothing new for the Star Ocean series—the main character of Star Ocean: The Second Story is an Earth Federation ensign stuck on a medieval planet—but telling the usual first-contact story from the other direction gives Integrity And Faithlessness a fun twist. Emerson, the game’s Captain Kirk stand-in, is a true bright spot, doing a laughable job at blending in as he constantly irritates his reluctant subordinate Anne with lines like “Look, another beautiful woman. I guess coming to this planet—er—town was worth it.” Soon Fidel and his crew are in the center of a proxy war between space-faring organizations, and by 12 hours in, they’re beaming into towns to turn in quests and doing their shopping aboard a Pangalactic Federation spaceship, which for some reason will accept the same currency used to buy blueberries in Fidel’s home village. An insane plot isn’t enough to carry a game, and Integrity And Faithlessness has made several changes to how the series plays but somehow failed to actually improve on it. In a bid to further push the seamless experience it creates by having fights happen on the world map or in the dungeon, rather than on a more traditional battle screen, Integrity And Faithlessness has largely ditched cutscenes in favor of having key dialogue delivered through “private actions.” The result is even more painful, trapping you in little zones of the world until some prescribed amount of dialogue plays out, showing off the game’s mediocre dubbing and thesaurus-heavy translation. Characters don’t turn to look at whoever’s speaking, meaning Fidel is often wandering around aimlessly even when he’s got lines to deliver. It makes the optional “private actions” you undertake to get to know your party and shape the game’s ending feel like an extra chore, particularly since these inane attempts at character building are dedicated to showcasing “hidden depths,” like the fact that Anne might be a tough brawler but she also loves kitties. The combat system also took the two steps forward one step back approach. Integrity And Faithlessness ups the number of characters you’re fielding to a maximum of seven, which is certainly a boon to players that don’t want to have to choose who to take into battle and like having a lot of different combat styles in a fight. But when you add in everyone’s flashy special attacks, having that many people on screen makes it hard to manage the rock-paper-scissors-style battle system you use to counter and guard against specific enemy actions. You get to fully control the actions of one character at a time and can pause the game to command the others—with the exception of Relia, who goes uncontrollable so as to make her a mysterious source of deus ex machina moments. Otherwise, you’re relying on the game to control most of your squad. That tends to work out fine for most minor encounters, but in boss fights or against bad guys with nasty attacks, you’ll discover how awful the AI is at getting your characters to run away from explosions or find spell-casters a safe place from which to heal everyone. Those problems are especially bad in fights where you have to prevent a specific character from going down to win or key battles where your primary healer is out of commission. You’re supposed to be able to fine-tune the AI through assigning roles from a list that expands as you level up and reach in-game milestones, starting with basics like “Attacker” and “Healer” and building into a staggering array of options including “Holy Mother” and “War God.” Unfortunately, the tactical element of these roles—like focusing attacks on enemies at low health—trade off with static bonuses from other roles that increase your health or damage. Figuring out which of these is best for a given circumstance adds tactical complexity to the game and the number of roles to level up and unlock lends a constant sense of progress. The best solution to the mediocre AI is another Japanese-RPG classic: grinding. Integrity And Faithlessness doesn’t do anything new here, so be prepared to take on some bland kill-and-gather quests from the anonymity of a town’s message board and wander the monotonous world map offing inexplicable monsters. Integrity And Faithlessness resembles some of the worst of Star Trek. While the game shares some plot elements with Star Trek: First Contact, it only achieves the writing quality of Star Trek: The Motion Picture. It’s got the ambition of being as flashy and action-packed as J.J. Abrams’ Star Trek, but the rough battle system can make it as awkward as watching a Vulcan martial arts lesson on Enterprise. It places importance on having your characters build relationships with each other, but their lack of depth or general likability makes the result more like Voyager than Next Generation. Series fanatics might forgive its sins, but Integrity And Faithlessness doesn’t offer much to anyone else.